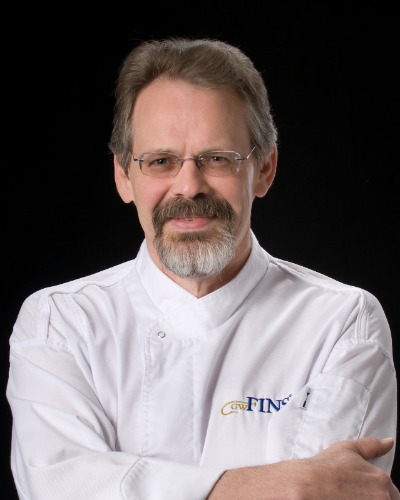 Chef Tenney Flynn will be a featured chef at IFBC New Orleans! This principal is the foundation of Chef Flynn’s restaurant, GW Fins, which he co-owns with Ruth’s Chris alumni, Gary Wollerman. The concept is simple. GW Fins offers guests the absolute finest and freshest seafood that is available from all corners of the world. Whether it is Salmon from Ireland, Spanner Crab from Australia, or Turbot from Chile, guests will have the opportunity to sample wonderful seafood from all over the world. “My culinary philosophy is that if you are working with seafood that already has wonderful flavor, the cooking techniques should enhance these flavors rather than overwhelm them,” states Flynn. Growing up cooking in his father’s restaurant in Stone Mountain, Georgia, Flynn developed an innate understanding of Southern food and culinary traditions. From there he received his formal training at the Culinary Institute of America at Hyde Park. Chef Flynn officially began his fine dining career with Atlanta’s esteemed Buckhead Life Group, cooking at such famed restaurants as Pano’s and Paul’s, Fishmarket at Lenox and finally as Executive Chef of Chops. Ruth’s Chris Steak House then recruited his talents as the company’s Director of Culinary Operations, a position he held for seven years. His role as Co-Owner and Executive Chef of GW Fins is extremely hands-on. Chef Flynn is involved in every aspect of the restaurant from selecting and receiving the seafood, creating and testing all of the recipes, supervising the entire kitchen staff and staying in the kitchen until the last entrée of the evening is served. “It is a lot of fun to offer people the opportunity to enjoy seafood from other regions, varieties that they probably have never tasted before,” states Chef Flynn. “I enjoy serving the types of foods that I’ve prepared over the years, like Fried Lobster Tail and Smoked Oysters, having guests enjoy them as much as I do.” GW Fins is located in New Orleans at 808 Bienville Street (504/581-3467). Please visit their website at www.gwfins.com for additional information.